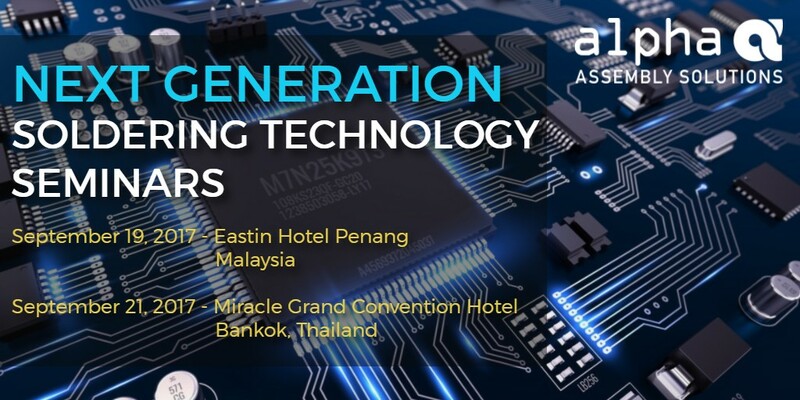 Alpha Assembly Solutions, the world leader in the production of electronic soldering and bonding materials, will be hosting full day seminars on “Next Generation Soldering Technology” on September 19 at Eastin Hotel Penang in Malaysia and September 21 at Miracle Grand Convention Hotel Bangkok in Thailand. Alpha Assembly Solutions, a part of the MacDermid Performance Solutions group of businesses, will share ideas and updates on an array of topics including low temperature soldering and void control in segments covering the PC, Mobile and Automotive space. In the early part of the seminar, a representative from iNEMI will discuss the solder alloy industry’s recent efforts to take low temperature soldering reliability to the next level. Subsequently, Alpha will provide an overview and history of low temperature soldering technology and how these efforts have resulted in a game changing low temperature material, “ALPHA® OM-550 HRL1 Solder Paste”, coming soon to the market. Following which, the seminar will wrap up with electronics developments in the Automotive industry and options for void management in typical BTC components, for seminar participants to stay up-to-date on these areas. “These seminars represent Alpha Assembly Solutions’ efforts to engage participants in a forum that facilitates a free exchange of ideas and techniques to benefit the industry as a whole”, said Phua Teo Leng, Regional Product Manager for Solder Paste. Alpha Assembly Solutions, a MacDermid Performance Solutions Business, is the global leader in the development, manufacturing and sales of innovative specialty materials used in a wide range of industry segments, including electronics assembly, power electronics, die attach, LED lighting, photovoltaics, semiconductor packaging, automotive and others. With a unique global presence in over 30 locations throughout the Asia Pacific, Americas and Europe regions, Alpha supplies a full line of ALPHA® electronics assembly material products, including Solder Paste, Exactalloy® Solder Preforms, Cored Solder Wire Solder, Wave Soldering Fluxes, Bar Solder Alloys, and Stencils. It offers die attach product technologies to the power electronics segment in its Argomax®, Atrox® and Fortibond™ brands. For the LED segment, Alpha offers its Lumet® products covering applications from die attach to systems assembly in the LED manufacturing process. Alpha also offers product technologies for the Photovoltaic segment, including high performance liquid fluxes and solder alloys for producing standard ribbon and bus bar, as well as, solder pastes, cored wire, conductive adhesives and preforms for use in PV module assembly. Also, Alpha’s Advanced Materials unit is the leader in electronic polymers and solder materials for semiconductor packaging applications. Since its founding in 1872, Alpha has been committed to developing and manufacturing the highest quality specialty materials. For more information, visit www.AlphaAssembly.com. ® Registered Trademark of MacDermid Performance Solutions. ™ Trademark of MacDermid Performance Solutions. © Platform Specialty Products Corporation and its subsidiaries 2017.